Take advantage of our special offers and promos when you enroll your child with us. Language development is ingrained in everyday life and therefore encouraged in a Montessori classroom through freedom of conversation, self-expression, and communication between peers, children, and adults. The Montessori classroom is organized in such a way that all lessons lend themselves naturally towards the development of written and oral language and reading. Norbeck Montessori encompasses all aspects of language arts and sensorial education as you would traditionally have in a classroom; reading, handwriting, spelling, grammar, creative writing, and oral presentation. Similar to Montessori Math, Language is a system of symbols and corresponding sounds which is a means of communication of ideas and feelings. When a child arrives at Norbeck Montessori, the child has already absorbed an understanding for the use of language. The Primary classroom at Norbeck Montessori has been curated with basic tools for language development. 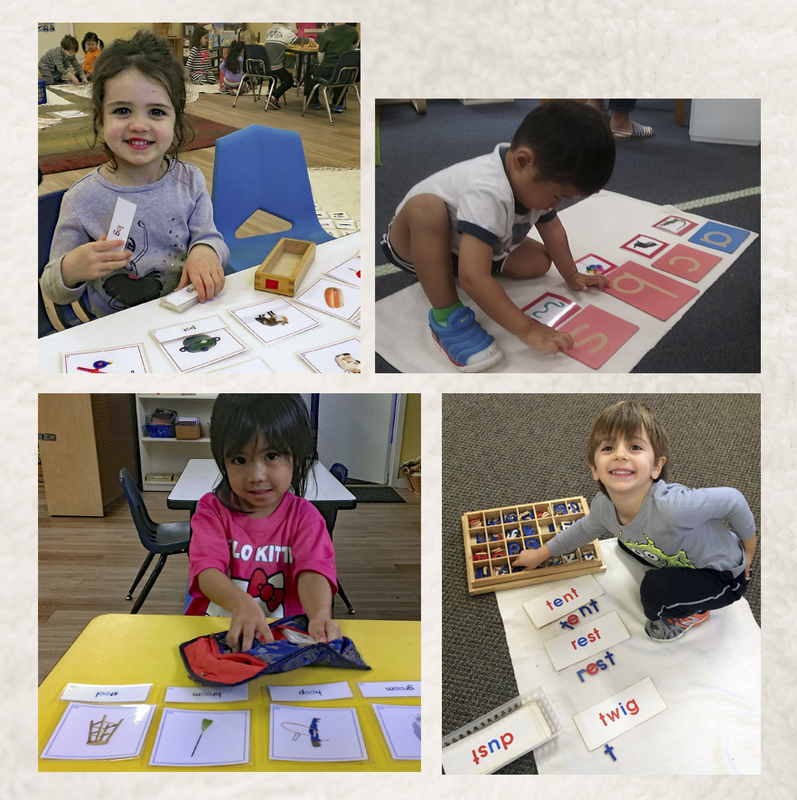 Get to learn more about our Montessori language development program when you call 301-924-4233 today! Handwriting is a process that requires much preparation because it combines manual dexterity and the ability to express thoughts with graphic symbols. Our children at Norbeck Montessori are preparing for writing through sound games, and Sandpaper Letters which help the children become aware that each sound has a symbol. With the Moveable Alphabet, children can put thought into symbols, “writing” their first single word. Daily practice of different strokes will refine the child’s hand movements and will continue to train the muscles. Some children will come to read in the “explosive period,” around 4 ½ years old. However, the child has been preparing for reading all along. Everything the child has been working on up to this point with Practical Life and Sensorial materials helps the child to read. Direct and indirect preparation play a significant role in a child’s joy of learning to read. 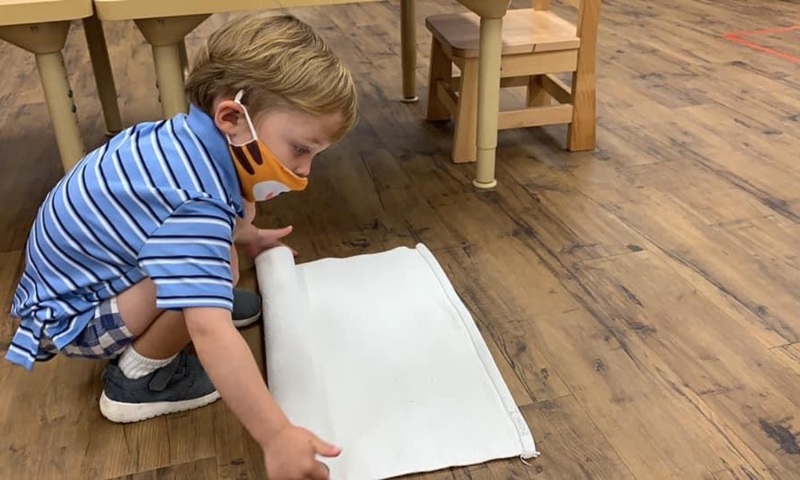 Sandpaper Letters, the Moveable Alphabet, and playing Sound games help the child to connect the sound to the written symbol. When a child puts symbols and sounds together, they are able to find that a word has meaning. As the child practices this process, they will move into greater and greater ease of reading. Language is the bridge to culture; it is used as guidance and instruction. Names are given to activities along with their function and purpose to build the child’s vocabulary. Experiences in the arts, dance, music, life and physical sciences, history, and geography all help inform and crystallize language. Every cultural lesson has a sensorial base for the child, teaching the child to participate and contribute which helps them to become an active member of society. Many parents ask how they can bring language learning and sensorial activities home. Well, this might be the easiest Montessori area to replicate. The next time you have a conversation with a baby, watch how the baby’s eyes focus on your mouth. Look closely as the baby watches the lips move; he looks at them most intently and tries to imitate the movements. There is no better time for children to learn words than between 3 and 6 years of age. Children are sponges at this age! Sing Songs with them from “Twinkle Twinkle Little Star” or “The Itsy Bitsy Spider.” Better yet, make up your own melodies and lyrics! Read, read, and then read some more. Read poems, nursery rhymes, counting books, picture books, or folk tales. Don’t limit yourself to reading books! Written language is everywhere, the grocery store, the doctor’s office, menus in restaurants and highway signs! Go ahead, use big words! Have you noticed that children love to try our big words like architecture or asparagus? Children are not only capable of learning big words and phrases but delighted to use them. So, don’t hold back! To learn more about Montessori education and our curriculum, call 301-924-4233 today!